Between the FitDog Friday and the Show Off Your Dog’s Waistline blog hops, pet bloggers have been working hard to raise awareness on dog’s health and fitness. Our dogs have always been pretty fit and healthy….we work hard to watch their weight and be sure that if they start to gain we get it under control quickly. With that in mind, both hubby and I have noticed lately that our beagle Cricket is a little on the heavy side. It is normal for her to get a little chunkier in the winter, when the dogs exercise less. Cricket has always been very slim, and tended towards the “too slim” side when she was younger and much more active. If she puts on a little weight in the winter, it quickly comes off when they start exercising more. But, like her parents, Cricket is getting older and the weight may not come off as easy. Most of her exercise comes from ball playing, and we mostly would leave the length of their game to them, in fact, we would usually put an end to the games because we’d get tired of it before the dogs did. Now that they are all over 8 years old, they are slowing down some, and sometimes choose to end the games sooner. I want to show some photos of Cricket I just took yesterday to see what you think. I weighed her on the scale yesterday and she weighed 26 lbs. She weighed 25.7 at her last vet appointment back in January. She has always been under 25 lbs, and at her appointments the last two years her weight was 23.6. Can you see the difference? I am certainly not saying that Cricket is extremely overweight, but we try to get this under control before it gets out of control (we use the same theory on ourselves). Especially where she is getting older, and she is a beagle (beagles tend to be overweight as they will eat as much as you are willing to feed them). Beagles know how to use their cuteness to get what they want, which really is just endless treats if they had their way! My goal is to make sure she gets enough exercise: maybe adding some more walks to her routine, especially when it gets hotter and they don’t play quite as much ball. Or make sure we have some ball games early in the morning when it’s cool, on the days that we can. Of course we have cut back a little bit on her meal portions, and she also gets smaller portions of treats. When she is at a healthy weight, she has often gotten around the same amount of food and treats as Kobi (who weighs about 35 lbs), because she has always been that much more active. I hope that within a month or so we can get her back down to 23.5 – 24 pounds. Maybe 2 pounds doesn’t sound like much, but on a dog her size I think it makes a big difference. What do you think – are we on the right track here, or are we being too hard on her? I am also going to read all the other FitDog Friday blog posts to learn other ways we can help Cricket get back in tip top shape. I will report back in a month and let you know how she’s doing! 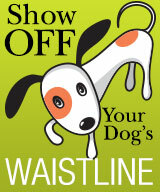 We are joining the Waistline Campaign blog hop. Click on the photo below to read more. This post is also part of the FitDog Friday blog hop hosted by SlimDoggy, Peggy’s Pet Place, and To Dog With Love. 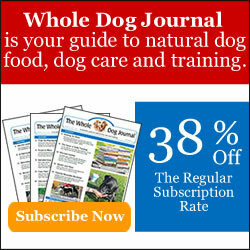 Please follow the links below to learn more about health and fitness for your pets! Thank you so much for taking part in healthy weight awareness! Yes, Cricket is looking pretty good but I believe that if she were a bit lighter she’d be happier, particularly as the years add up. Every little bit can make a big difference. I also notice on the photos that her shoulders are somewhat broad. Is she having difficulties/pain in her rear legs? If so, that would be another reason to get her slimmed down further. Thanks, I am glad to join in, it’s a great campaign and has certainly helped me to try to be more aware. Cricket is not having any problems with her rear legs, but we will certainly keep an eye on that. She’s always been very stocky and when she walks she’s like a bulldozer plowing forward! I think you are right on with 3-4 a well and at her size 1-2 pounds does make a difference! At least you are on top of it, that is important. We tend to be thinner in the winter because we are out more. Mom is not big on hot weather and neither are us dogs, so we walk early mornings in the summer but then not much more the rest of the day whereas in the winter we walk all the time, we all like the cold. I don’t know what more you can do other than cut back on snacks and food and exercise a bit more. The extra pound should fall quickly. Thanks, Emma! I wish I could love Winter like you all do! I don’t love the really hot weather either (and we get more of that here in NH than we used to), so we probably walk the most in the Spring and the Fall. But at least with the Idita-Walk, we got out a lot more this last Winter, and it was enjoyable, so we’re getting better anyway! Finn has always been a bit chunky. We make sure to take her on walks every day (love it in the winter) and then on weekends we have a really long outing to give her even more exercise. We had to cut back on er treats too. I think you are on the right track. Thank you, it is so good to know that everyone agrees with me. Our other beagle Kobi tends to get overweight sometimes, but he’s actually been in pretty good shape for a while now, even though he is older (12). I also tend to do shorter walks during the week and then longer ones on the weekend. Between 3-4 gets my vote too. You’re good to nip it in the bud early like you are doing. Just like people, I think it’s harder for dogs to lose weight as they get older. Their metabolism slows down too. Good idea to read our posts – lots of good ideas there I think. Thanks for joining the Hop. Thank you! Right now, I think Cricket and I are close to the same age technically, so she and I could make good workout partners! 🙂 I’m working my way through all the other posts, and here are some great tips out there. I would agree with you that, while not clearly overweight, Cricket doesn’t fit neatly into the fit category either. I think you are on the right track. While now is no time to panic, it is the time to get her weight gain under control before she does become too overweight. While 2# is a lot for a smaller dog, it’s a heck of a bigger deal on Chester (10 lbs) than Cricket. Yes, I can see what you mean, Jessica, and I totally agree. Thanks for confirmation of my thoughts. Oh my gosh, I think Cricket is small, Chester sounds so tiny!